According to an announcement by the Japan National Tourism Organization (JNTO) in the beginning of this year, there has been an increased number of visitors from six ASEAN*-member countries to Japan. The 2,520,000 visitors reached record crests and was a 21.3% increase from the previous year. Halal food is one of the required items to make them feel welcome. Happo-en therefore started to serve Halal-friendly dishes at our Japanese restaurant “Kochu-an” on December 1st, 2017. We use Halal ingredients and seasonings for our Halal dishes. 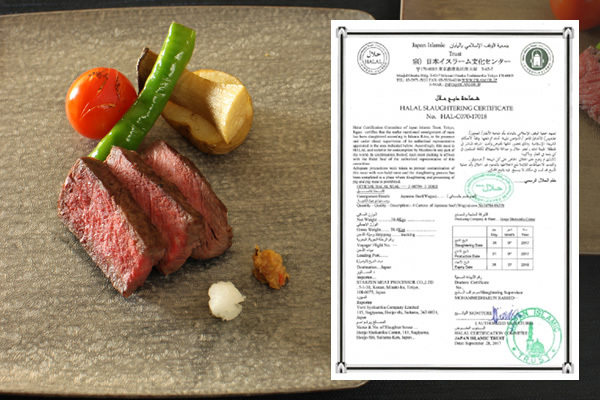 Enjoy our Halal-friendly full course meals with Halal Wagyu beef (with Halal certification). You can have a great time with Halal-friendly dishes in a private dining room that has tatami-mat flooring while viewing our beautiful Japanese garden.